Are You Aware of the Hidden Dangers of Basement Flooding? Is there water in your basement after a heavy rain? Obviously a major basement flood is a catastrophe that requires your immediate attention, but you may not realize that even the most seemingly insignificant flooding is a major problem. The dangers of water damage aren’t always visible, and the hidden dangers of basement flooding are often more devastating than the water itself. If your basement is wet after it rains, it’s time to consider waterproofing your basement. At Larry & Sons, we offer basement waterproofing in Hagerstown in the surrounding areas. Finding your basement full of water is the most obvious sign that you have a problem, but there are several subtle signs that you shouldn’t ignore. If you’ve noticed any of these things in your basement, you have a problem that needs to be dealt with promptly to avoid further damage. Basement flooding can have devastating consequences, and it’s important to note that many homeowner’s insurance policies don’t cover water or flood damage. Immediate damage to your possessions is a top concern when it comes to flooding, but it’s not the only thing you should be worried about. Excess moisture in your basement can lead to cracks in your foundation and seriously compromise the structural integrity of your home. It can also cause wood beams and supports to rot. If you’re like most people, your HVAC system and water heater are located in your basement. If your basement is damp, the moisture can cause serious damage and even lead to premature system failure. If your washer and dryer are located in your basement, they’re at risk, too. All those things can be replaced, but the most serious risk of moisture in your basement is to your health. A wet basement is a serious health hazard. Damp areas are the perfect breeding ground for mold, mildew and fungus, and these things are all known to cause respiratory problems. If you have standing water in your basement, it may also put you at risk for electrical shock should wires or electrical components come in contact with the water. 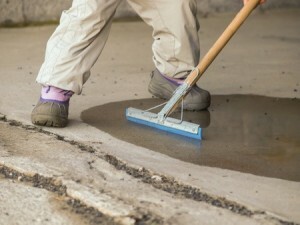 Whether you’ve had a major flood or you regularly notice a damp feeling in your basement, now is the time to consider basement waterproofing. At Larry & Sons, we are waterproofing experts, and we will work with you to find the solution that is most appropriate for your home. For a limited time, we’re offering a FREE GENERATOR to anyone who invests in a Larry & Sons Waterproofing Solution. Don’t wait until the the moisture in your basement gets worse, schedule a free consultation for basement waterproofing today.